I have been improving the lawn. A bit of filling a deeper area with soil and re-seeding. It took a few weeks and the green grass had appeared and it looked good. At this point, the roofer came to re-cover the top of the back bedroom bay window. We first asked a builder friend of ours to do the job last autumn and he said that his business partner was a roofer and he would do it. We had to get rid of the wasps first. Then there were delays due to the frost – the resin reacts badly to frost. We kept chasing and then a third person was now going to do the job. Finally I rang my friend, who was upset at his associates for letting us down. Later that day the third person rang and he would do the job in two days, and actually arrived (I found out later the gist of the conversation that had taken place, builder to builder ! ). He brought two young blokes who actually did the job. They had not been up on the roof long when I noticed a white plastic lid spinning down from the roof. It landed slap bang in the middle of my newly seeded grass, which was about 10 yards from the house, inside downwards. I told the lads and one dashed down the ladder to grab the lid back, saying that “everything would be ok”. They completed the job and went. Three days later we looked out of the bedroom window and saw a round white patch in the middle of the newly seeded area of lawn. The grass blades had all turned white. 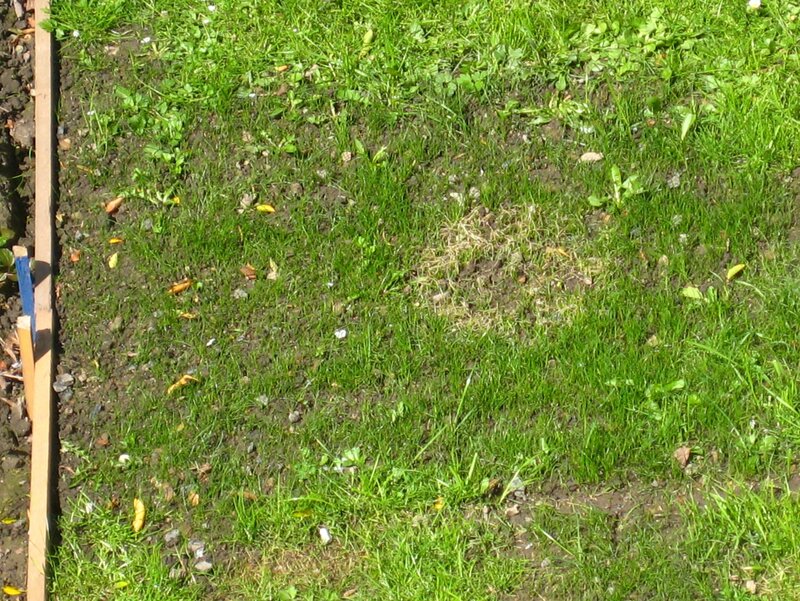 White patch on newly seeded area of lawn, caused by resin from roof. Mick Burton photo. We realised that although the resin may be vulnerable to frost it could be lethal to grass. At the time I was reading a book entitled “Sod’s Law”, sub-titled “Why life always lands butter side down”. I was also reading a book I had borrowed called “Time” by the nature and landscape sculptor Andy Goldsworthy. He sets up sculptures in natural surroundings and watches how they cope with the elements. 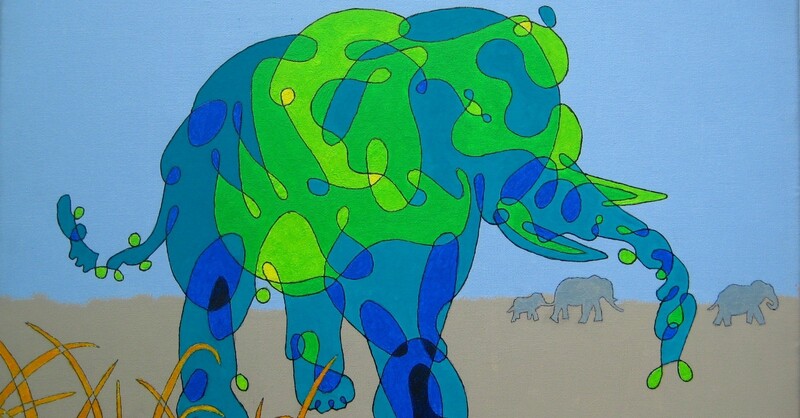 In his early days it might be a “frost shadow” or a continuous line drawn with a stick on the beach. I wondered whether Sod’s Law or nature would win in the battle for my new grass. 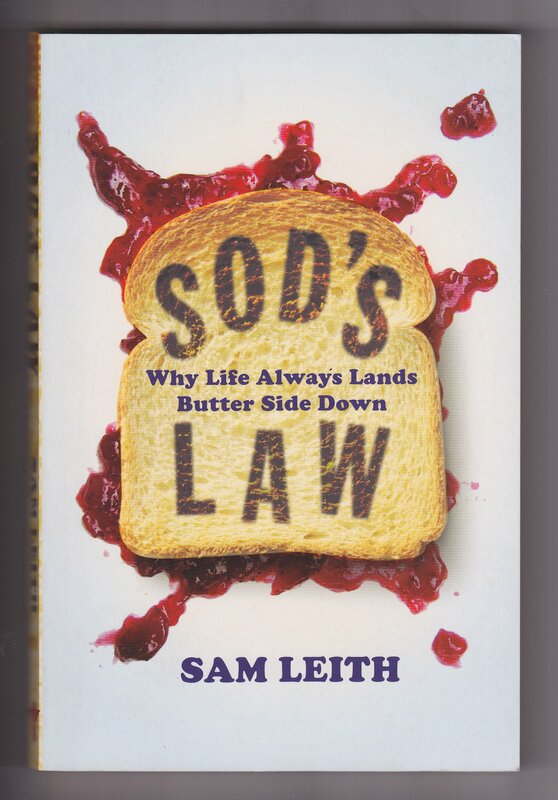 “Sod’s Law” by Sam Leith, Atlantic Books. Two days later, Joan called me to the window. 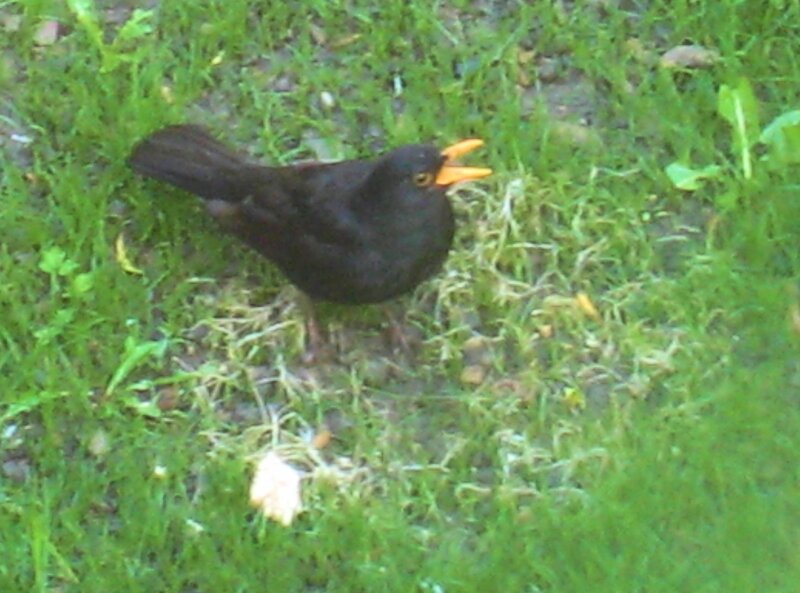 Standing in the middle of the white patch on the lawn was our local blackbird. It had brought a piece of bread and had dropped it. He spent 10 minutes on the patch pecking away. Had the resin lured all sorts of bugs and worms to the surface? Could I class this as another of my Black and White creations? Blackbird standing in white patch for 10 minutes, finding all sorts of treats. Mick Burton photo. The blackbirds have been busy recently. They built a nest behind the small willow under the eves of the garage 10 feet from the kitchen window. We were looking forward to the view of the chicks, but next door’s cat kept sitting on the garage roof just above the nest. So they built another nest in the holly bush higher up the garden. The blackbirds always provide much entertainment. Last year we saw one fill its mouth full of worms in the front garden. 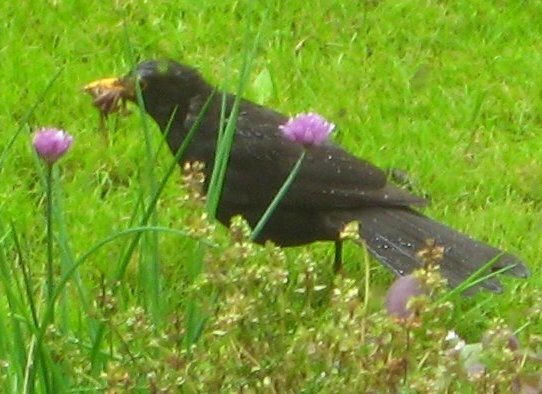 Blackbird last summer with a mouth full of worms. Mick Burton photo. This entry was posted in Animals, Gledhow Valley Woods and tagged Andy Goldsworthy, bird, black and white, blackbird, Cat, Continuous Line, Continuous line drawing, frost shadow, Mick Burton photo., sculpture, Sod's Law, Time on May 20, 2015 by mickburton2.